Compare prices on car hire in Strasbourg Airport from all the major brands and find the best deals. When you book through us, unlimited mileage and insurance are always included in the price given. Strasbourg Airport (SXB) is about 15 km west southwest of Strasbourg in France .There is a new train that runs every fifteen minutes and takes only 9 minutes between the airport and Strasbourg. The car rental companies represented are Hertz, Sixt, Avis, Europcar and National / quote. 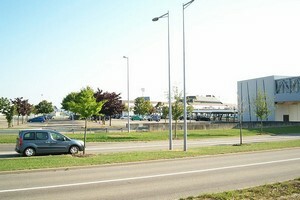 1.7 million passengers visited Strasbourg Airport in 2007. The airport serves about 15 different international destinations in Europe and North Africa. The Air France serving the most destinations. There are several bars and cafes at the airport as well as two restaurants one of which serves regional specialties. When it comes to stores as there are tax free and a shop selling regional products called Découvrir l’Alsace “. Other amenities include wireless internet, meeting rooms and conference center, ATM and travel agency. The nearest hotels are the Hôtel Père Benoît and Ibis Strasbourg Aeroport.